Blame it on the Jet Stream. Blame it on the Sun Spots. Blame it on the Industrial Revolution. I say blame it on the Boogie, then we can move on. Ha ha. Whatever, this summer has been a mudbath and I have not even been to a festival yet! 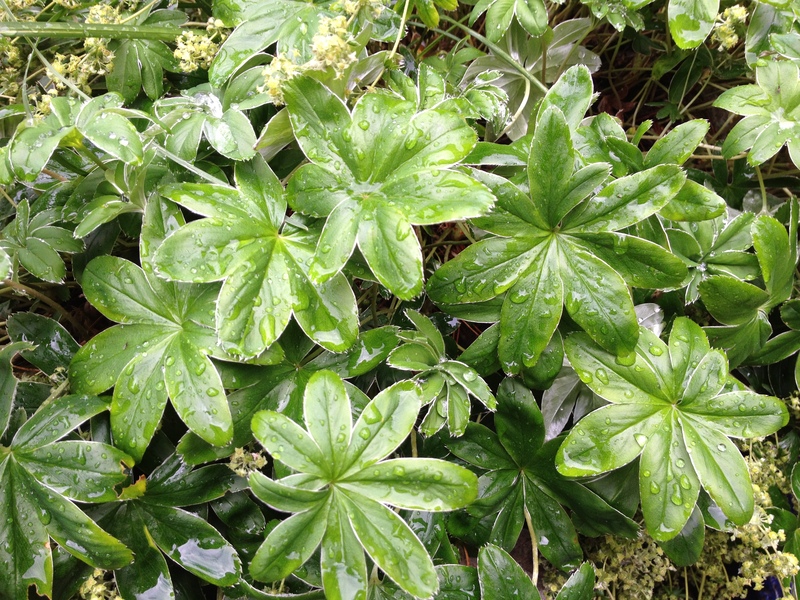 I have resorted to planting-up in the rain ( the lighter rain) and putting up with the mud. I am not averse to being outside in inclement weather, but I do get fed up of the regular muddy clothes wash, floor mop and scrubbing down of the tools. Miraculously, the gardens are all still looking magnificent. Maybe not quite as colourful or fragrant as you would wish, but it is hard to repress the true nature of summer. We may have masses of foliage this year but that on its own holds a fascinating beauty. We forget about the colour variations, the texture and the different forms that foliage presents. 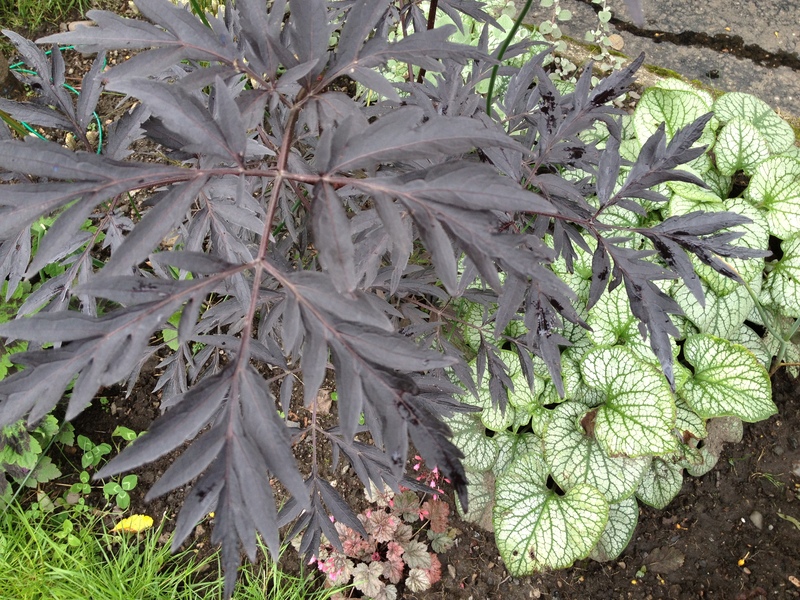 I’m thinking of Sambucus nigra ‘Black Lace’, with it’s fern-like, dark purple-almost black leaves, Brunnera with its sprinklings of silver and even the beautiful annual Cosmos, which has that ethereal Fennel-like foliage creating a green haze in the border. Ferns themselves are always interesting and varied and are often under-appreciated for their role in the garden. Shrubs whose flowering season is over can also play a part in the garden long into the season. Tree peonies, for instance, with their deeply divided blue-green leaves, and Weigela florida ‘Variegata’, also with blue-green leaves and a creamy border. And of course, there is the magnificent Hosta. What would a garden be without it? I have been gifted an encyclopedia of Hostas, and I love it. My current favourites are ‘Wide Brim’ and ‘Patriot’. I would fill my garden with them, if it were not for the armies of slugs that inhabit the area. 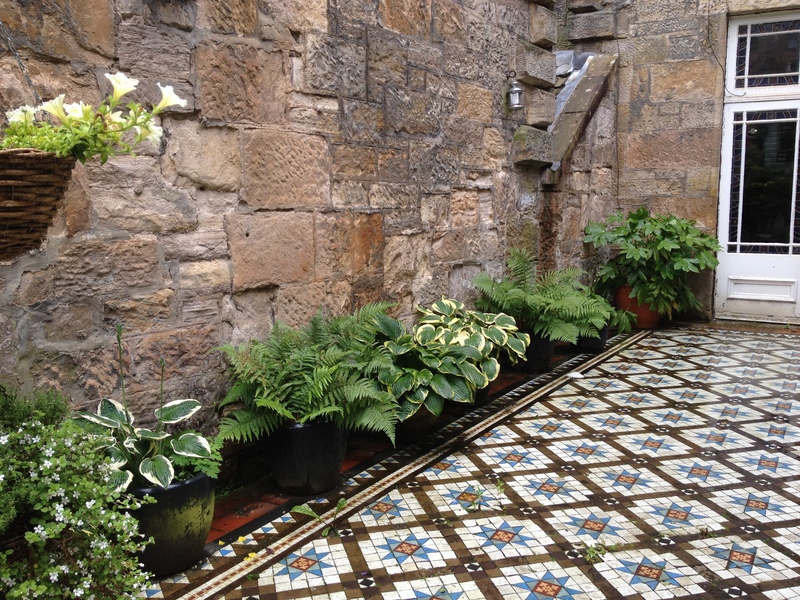 My Hostas are all in pots, and I’ve said this before, it’s a good place for them. It sets off the shape of the plant, you can put them wherever you want, and the slugs have to try really hard to get at them. Let’s here it for the Hosta! This year I had high hopes for grasses that I had planted in the garden. Briza ( maxima and media), which have done fairly well; Stipa gigantea and Calamagrostis ‘Karl Foerster’ have struggled against the elements. The Stipa has thrown out only one lonely, but lovely stem, whilst the poor KF has been decimated by wind, even in it’s sheltered spot. Normally these would add to the rich tapestry created by foliage, creating shimmering screens so hopefully next year they will be able to fulfill their purpose. 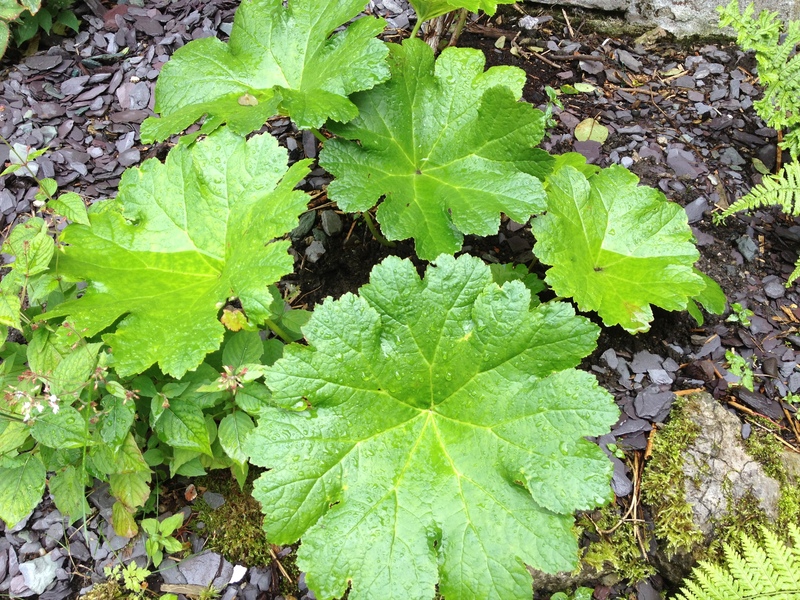 My new favorite plant for damp shady corners is Darmera peltata. 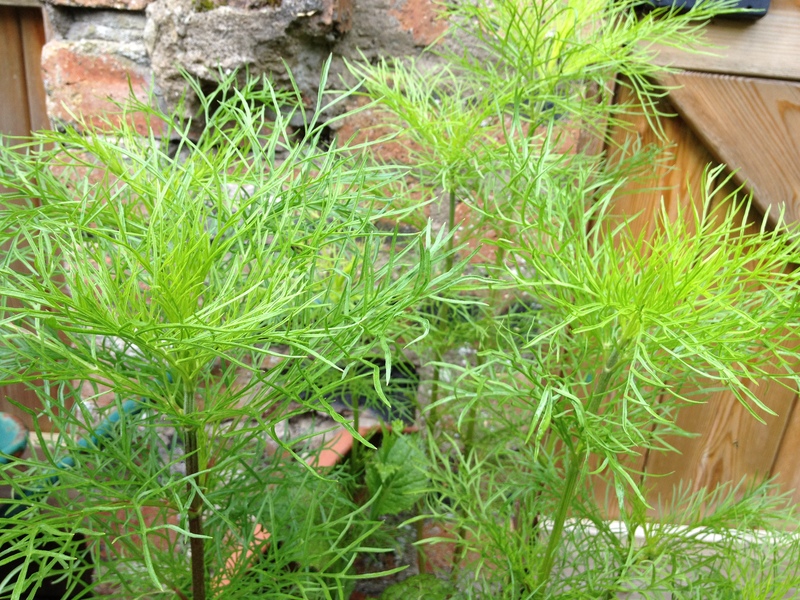 It has huge, flattish, bowl-like leaves that are really eye-catching and pink flower spikes earlier in the year. You need a big space for it! I’ve only touched on a handful of plants with lovely foliage and I will lie in bed tonight thinking of probably even better ones. Do let me know your favourites!